Are you available for travel if I'm not local to San Diego? My travel schedule is limited but please feel free to contact me to see if I am available. Where do you do portrait sessions? You get to choose your location for the portrait session. I recommend a location that has special meaning to you or if you don't have a preference I can give you some suggestions. The best time of day for portrait sessions is typically a couple of hours before sunset but I can always accommodate your schedule. Your clothes are a reflection of you so don't be afraid to show off your style. Layers are a great way to help create depth in photographs and can create multiple looks during the shoot. For couples and family shoots outfits should be coordinating but not matching. If you're still feeling stuck with what to wear shoot me an email and I can send you some examples outfits. 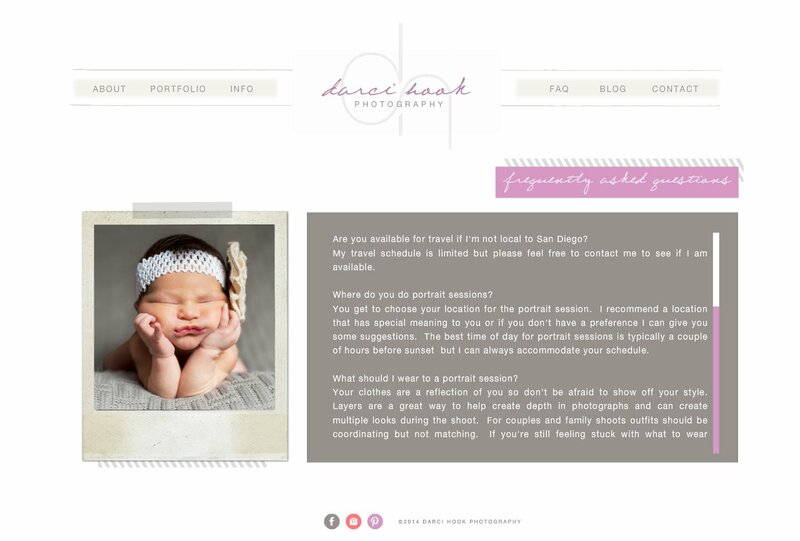 When is the best time to do newborn shoots? The optimal time frame is between 5 days to 2 weeks old. Can we get some family photos during the newborn shoot? Of course and I highly recommend it. Is there anything we should do in preparation for the newborn shoot? Yes I recommend that you make sure your baby is fed at least 30 minutes prior to the start of the session. Also if you are doing family pictures please make sure everyone is ready (dressed, hair, makeup) prior to the start of the session. What is the advantage of having a second shooter for a wedding and do I really need one? Second shooters are skilled photographers that I hire to help me capture all the wonderful moments during your wedding. A second shooter captures many of the candid moments during the pre-wedding, wedding, cocktail hour, and reception that the main photographer may not be able to capture on their own. I highly recommend having a second shooter but it is not always necessary depending on the size of your wedding. Please feel free to contact me so we can discuss your options and find out what works best for you. Do you offer albums and prints? Yes I do. These are part of my al a carte items and are available for weddings, portraits, or newborn shoots. I highly recommend albums and prints because you'll want to show off these great images to your family and friends. Contact me to discuss options and pricing. How do I go about purchasing your Fine Art Photographs? Prints can be purchased from The Store website. Custom framed photographs are also available. Please contact me for pricing or to place an order.